Dean’s Executive Board member Russ Robinson, son of Jerome Robinson, introduced his nephew Daniel Robinson, who gave a moving tribute to his grandfather during the celebration. The University of Houston C. T. Bauer College of Business celebrated the Jerome Robinson family and the spirit of entrepreneurship that runs through the family, the college, the university and the city at an event on Feb. 18. 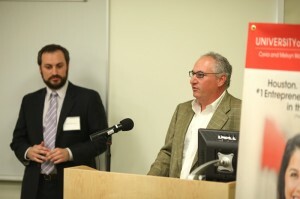 The celebration honored The Jerome Robinson Family Fund for Graduate Entrepreneurship, which will broaden entrepreneurship curriculum in the college to include graduate-level courses, along with the undergraduate program in the Cyvia and Melvyn Wolff Center for Entrepreneurship. The fund is named for Jerome Robinson (1929-2009), a successful business owner and prominent philanthropist in the city. Passionate about family, community and education, Robinson’s legacy is one of hard work, honesty and integrity. Even after leaving the UH campus with his degree, Robinson stayed connected to his alma mater and was honored in 1995 by UH Bauer as an outstanding alumnus of the college. “He was grateful to the university. He thought it gave him everything,” said grandson Daniel Robinson, who was one of many family members in attendance at the event in Cemo Hall to recognize the gift. The Wolff Center program, which ranks as the No. 1 undergraduate entrepreneurship program in the nation according to The Princeton Review and Entrepreneur, will be strengthened by the addition of the graduate certificate program, Dean Arthur Warga said. “To have this graduate certificate program within the Wolff Center helps grow an entrepreneurial umbrella around education in the city of Houston that hopefully will be the match to the entrepreneurial spirit that exists in this city,” he added. Two UH Bauer students spoke about their experiences in the college’s graduate entrepreneurship courses, exemplifying the business and education virtues that Robinson extolled. UH System Chancellor Renu Khator, left, and Dean Arthur Warga, right, welcomed Minnette Robinson to the reception, along with MBA entrepreneurship student Ryan Soroka. With the help of his professors and the abundance of networking opportunities offered by Bauer, Soroka has been able to successfully shape two businesses today. Nithin Rajan, now program manager for the college’s graduate entrepreneurship certificate, is another student who has directly benefited from the opportunities given to students in the program. He has found success through the help of the people he has encountered in his time at Bauer. “I encountered passionate students, faculty, and most importantly, I encountered real world entrepreneurs, like the Robinson and others, who come to the university to give back and also serve as an inspiration to young entrepreneurs like myself to take risks,” he said. Following the example of Jerome Robinson, he has chosen to give back to the students by becoming an advisor and assist in guiding students through their time at Bauer. 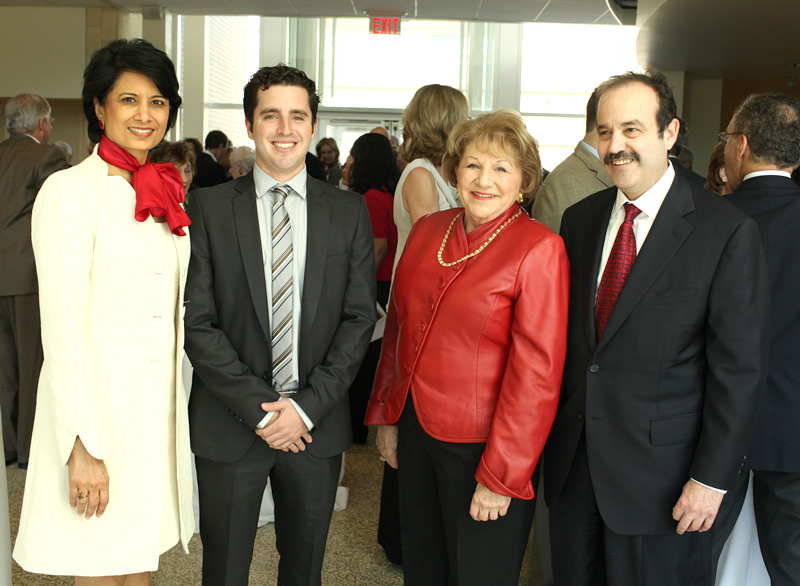 It is through donations and contributions like this that the University of Houston and Bauer are able to provide a solid support system for their students and lead them to future successes, UH System Chancellor Renu Khator said. “Great universities are built by great communities,” Khator added. It is fitting that Jerome Robinson has been honored by this gift to UH Bauer. Aside from the man who this school is named after, I cannot think of anyone besides Jerome who embodied all of the goals that are taught at this outstanding school. He carried on a tradition that will continue to benefit society and his alma mater. As so eloquently stated by his grandson Daniel and demonstrated by his family’s perpetuating his legacy, Jerome has left the world a better place. I am proud to have been a friend of Jerome Robinson, his wife Minnette and their family.